Want to customize your Freightliner FLD 120? Look no further than these Projector Headlights. Not only will it add to the look of your truck but it will drastically improve your vision at night. To purchase these lights click on the link below. This is our Outlaw Customs Peterbilt 379 one piece window conversion kit. 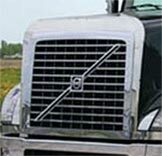 It is meant to eliminate the wing window found in pre 2005 Peterbilt 379 and 359's. It will give your truck and updated look. This kit is complete with everything you need and can be installed in 5-6 hours in your driveway. Window glass with polished edges. Comes in factory green or an internally smoked tint. Now $750 Click on link below to purchase online. 2x Stainless steel Peterbilt headlights with H-4 Projector Bulbs and LED Turn signal. Steel the show with Outlaw Customs Criminal Headlight Brackets for Peterbilt 359, 379, 389 trucks. These are the hottest new headlight brackets on the market with the most diverse lighting options around. You can run 100's of lighting options with these brackets, from drive & fog lights to turn signals. They are polished cast aluminum giving you the options to have a high polish look or paint the brackets to match your truck. These brackets also work great with custom Jones Performance Hoods for Freightliner Classics, and Kenworth W-900. Available in 2 styles Smooth and our limited edition embossed 6 shooter chamber for the real Outlaws.